Today's ever changing society, along with the environments we work and live in, provide some of the hardest challenges where hygiene and durability are required. Altersoft designs and manufactures product solutions to meet these requirements. Integrating the latest technology available exceed most performance criteria. Sustainability is a critical issue for the future. IPtoilet with its intelligence, keep hygiene even with improper usage of occupants. IPtoilet has luxurious interiors and touch-free operations: The travelers prefer the comfort of their home toilets because of its neatness, hygiene, convenience and safety they enjoyed inside. IPtoilets give a world class experience of hygiene in public toilets. We never fail to maintain toilet hygiene at our home, but that is not the case in public toilets. On top is the acute shortage of labour for cleaning lavatories. The timed pressure sprayers, perforated floors, auto-flush and the stainless steel body helps in self-cleaning of our toilets. It is commonly observed in public toilets that people tend to spoil the door handle, switches, tap knobs, or flush knobs by rough use. By automating these operations, there is no need for any manual intervention except manually bolting the door from inside. It ensures minimum user contact and thus maximum hygiene. At most care is taken to design its body fabrication tamper proof and rust proof. It is portable in whole or packed to install at site. It has different sizes as per number of usage units in a single console. It never lets a person trapped inside as there is only manual locking of the toilets once a person comes inside. Tamper proof fasteners with stainless steel 304 grade facades of walls and roof, and bottom 316 grade 3mm stainless steel sheets with perforation, ensures hygiene at public usage. At most care has given to usage of water and power. There are optional features like air conditioner, solar panels and bio membrane tank. The self cleaning toilets having pressure cleaning facility require regular monitoring and attention; but with less frequency per unit. This will save considerable labor and material cost in operations. Altersoft Innovations India Private Limited is a multi-faceted product engineering services company focused on embedded system development and industrial solution integration. Altersoft’s customized solutions for Tracking and Automation are being widely used in Private, Government and Public sector environments. The technology expertise in the area of IoT, Mobile platforms and field automation empower Altersoft to provide reliable solutions to its customers. There are successful implementations of control systems that spread in wide geographical areas and in multiple geographical locations. In addition to above, Altersoft’s product engineering group brings innovative products that emphasize not only on commercial values but social aspects too. Intelligent Public Toilet (IPtoilt ™) is such a product developed by Altersoft, with the aim of providing sustainable and hygienic public sanitation with the use of advanced automation methodologies. IPtoilet resolves operational bottlenecks faced in Public Toilet Management by the application of state-of-the-art technologies. 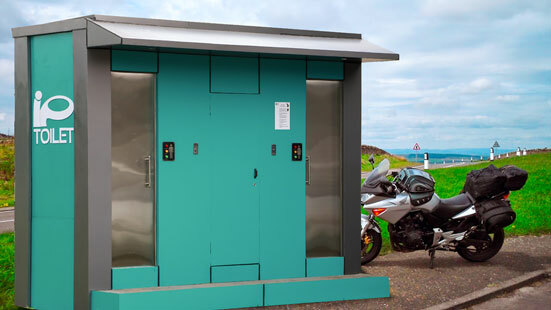 IPtoilet has luxurious interiors with hydrophobic coating to address Indian conditions and touch-free operations: The travelers prefer the comfort of IPtoilets because of its neatness, hygiene, convenience and safety they enjoyed inside. IPtoilets are designed with an aim of giving a world class experience in public toilets with IoT, robotics and ewallet enabled! Altersoft technical team is also under R & D for the development of IoT enabled waste-bin project, Napking Incinerator working on solar, Automated IoT and eWallet integrated napkin vending machine, Robotic arm to clean Indian and Western style Toilet, etc.